To celebrate the 2019 Masters, which takes place from April 11-14, Jordan Brand will be celebrating the occasion with a special Air Jordan 11 Low Golf colorway. Dubbed, “Masters” the golf-edition of the Air Jordan 11 Low will commemorate the 2019 tournament at Augusta National Golf Club. The shoe features a Green snakeskin leather upper paired with White leather on the mudguard. Other details includes Yellow and Green hands logo with a Red Jumpman stitched on each tongue. A studded Metallic Silver outsole completes the design. There will also be a matching Air Max 1 Golf releasing alongside this pair to complete the upcoming “Snake” Pack. Look for the Air Jordan 11 Low Golf “Masters” to release on April 12th at select retailers and Nike.com. The retail price tag is set at $220 USD. UPDATE: According to Jacques Slade, Nike Golf has canceled the “Snake Pack” that was scheduled to release for the 2019 Masters. 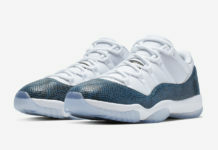 The pack included the Air Jordan 11 Low, Air Max 1, Vapor React 2, Victory Tour and other performance styles.